If you’re building a cloud solution you understand that getting expert advice rapidly better enables you to build solutions that address your business’ or customer’s needs. I have been working with System Center and Cloud implementations for quite a while now as well as writing books about System Center. Deploying cloud management solutions like System Center requires an approach that takes advantage of the opportunities and features offered by the virtualization layer. Beyond IT productivity, cloud management can dramatically improve business agility. However, an evolving cloud architecture can also lead to waste and inefficiency. Has the efficiency of your cloud architecture been reviewed overtime? Are you optimally defining the placement of workloads? One of the concerns I always raise when speaking with decision makers and cloud adopters is ongoing management, especially with respect to increasing virtual machine density, preventing resource exhaustion, and tuning your environment to build a tailored virtualized infrastructure for your organization that will stand the test of time. As an automated solution for infrastructure reviews, I definitely recommend Savision Cloud Advisor which provides an impact analysis for each problem it discovers and identifies savings for your business. At TechEd NZ 2014 keynote speaker James Whittaker, talked about DATA as a power enablement. That’s exactly what this tool is about. It analyses the information VMM stores in the SQL database, using statistical techniques with the goal of discovering useful information, providing tips for your Private Cloud implementation. A big plus for the tool is that it does not impose any load on the hosts or virtual machines. All information used in tip generation is retrieved from the System Center Virtual Machine Manager (VMM) database. Download Cloud Advisor (http://www.savision.com/free-tuning-and-optimization-recommendations) as a zip file (don’t extract it). Note: the add-in should be installed on each machine running the VMM console. 4. 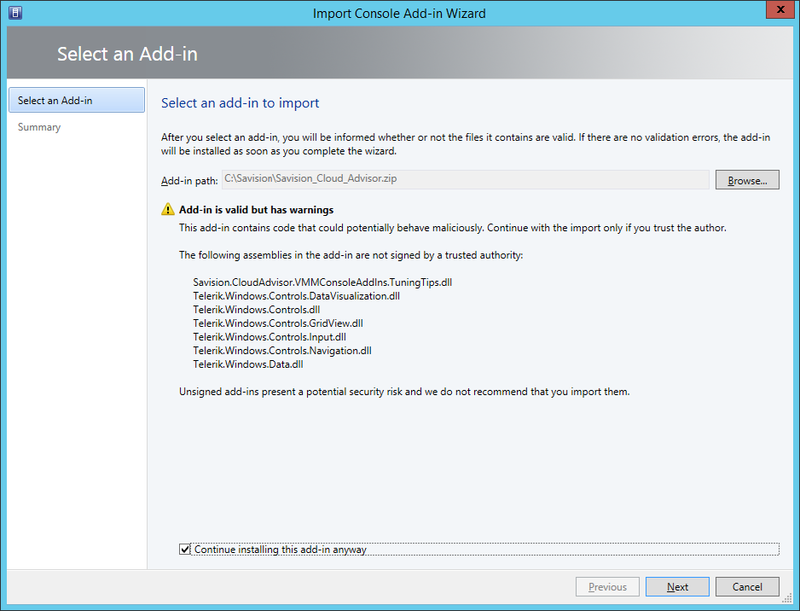 On the VMM 2012 R2 Console, logon as VMM Admin, click on Settings and then click on Import Console Add-In. 7. Make sure Continue installing this add-in anyway is checked. 8. Click on Next and then click on Finish. 9. Close the VMM Console and then re-open it. 10. The Cloud Advisor add-in will appear on the VMM ribbon bar when a host, cluster, or cloud is selected. Note: The first time you run the add-in, it will prompt you for credentials to the SQL Server database in which VMM stores performance data. This performance data is used to assist in generating tuning tips. Provide the credentials of a user that has read access to the SQL database and click Connect. For more information, read more about Savision’s Cloud Advisor FREE tool for free tuning and optimization recommendations for System Center VMM or visit Savision’s training center.